Admins can make a task appear prominently to specific users or user groups by @mentioning their name or role within that task. 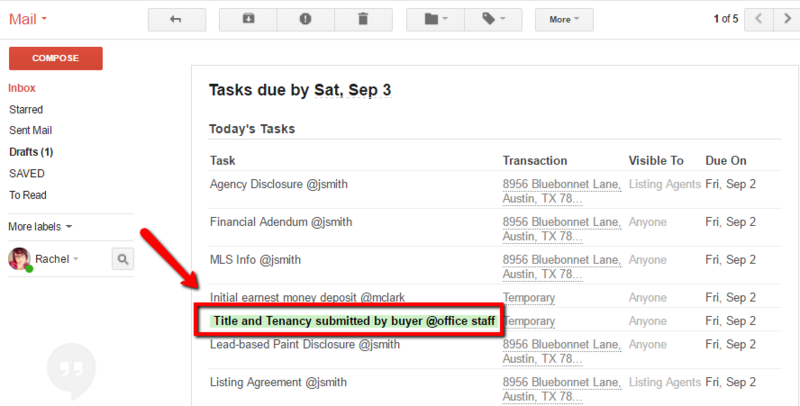 The @mentioned users will see such tasks highlighted on the Transaction page, Tasks page, and in received emails. @lastname will work for most cases where you want to address a specific user. But if you have multiple users with the same last name, use their first initial and full last name. For example, use @jsmith to mention John Smith and @asmith to mention Anne Smith. Enter multiple, separate @mentions using the method above. Enter their role (as defined in the Role field of their Manage Users profil. 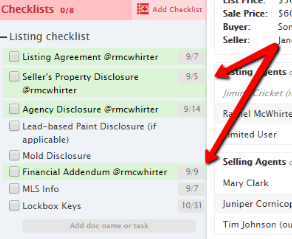 To set a task to be highlighted for a specific user or group of users, edit the task name on either the checklist template (if you need the @mention to be present on all transactions where the task is used) or directly on the transaction (if you need the @mention to only be for a specific transaction). Click the checklist name that contains the task to open the checklist template. @mention the user’s name or role in the task name. Click the [Pencil] to edit the desired task. When sending a note or email from a transaction, if you append complete, overdue, or incomplete tasks, the recipient’s @mentioned tasks will be automatically highlighted in the message. Users can click "Your @ Tasks" to view tasks where they are @mentioned. They can also sync just their @mentioned tasks to their external calendar by selecting "Your @ Tasks" then selecting the appropriate sync option. Clicking the "Showing @ Tasks" button turns off the filter and shows all tasks visible to the user. Q: Can agents add @mentions to tasks? A: No. The ability to manage and edit tasks (including adding @mentions) is an admin function and is not suitable for agents. Q: Does @mentioning someone trigger reminders to be sent to them? Does it prevent reminders from being sent to others?